A red oak in Washington, D.C., that's estimated to have started its life in 1692 developed a fatal crack in its trunk. A red oak in Washington, D.C., recently developed a fatal crack in its trunk. Part of the tree fell before crews could dismantle it. The tree's age was estimated by counting the rings in its trunk and by comparing its 66-inch diameter to the average growth rates for red oaks. Generations have come and gone under its branches. Its leaves soaked up rays from the sun that shone on the American Colonies. But after an estimated 325 years of life, an oak tree in a residential neighborhood in Washington, D.C., has now fallen victim to time. Dana Ju, whose young family had been the latest to play under the tree's broad canopy on Washington's Floral Street, says they're "very sad about the tree but feel very fortunate we were not inside our home when it fell." 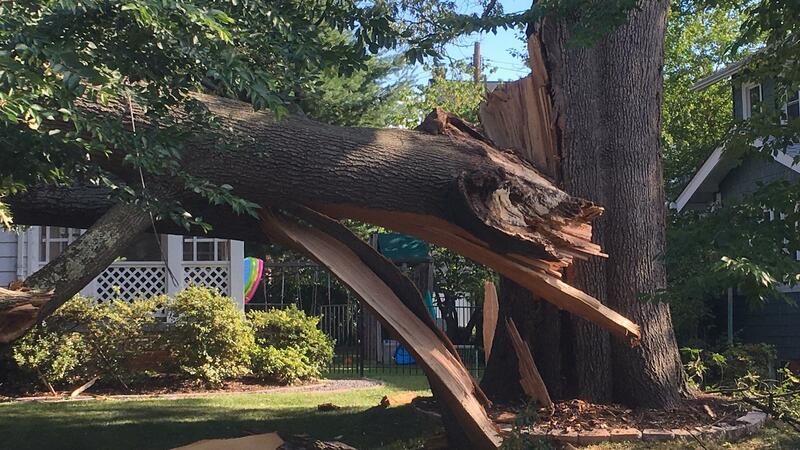 The red oak had grown to a height of 75 feet, and it seems that its size might have been its undoing. 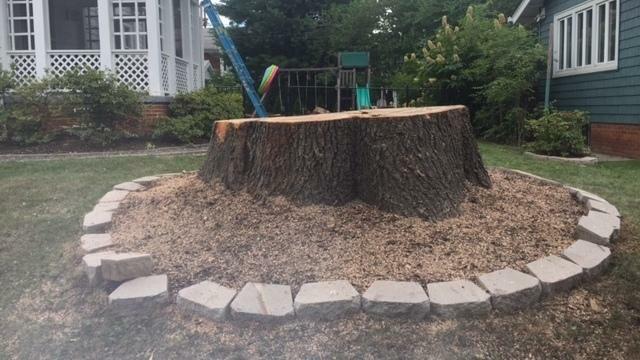 After a crack formed in its massive trunk, arborists determined there was no way to save the tree — and even before crews could begin dismantling it, part of the tree broke off. By then, Ju and her family had moved out temporarily, and neighbors had moved their cars as a precaution. 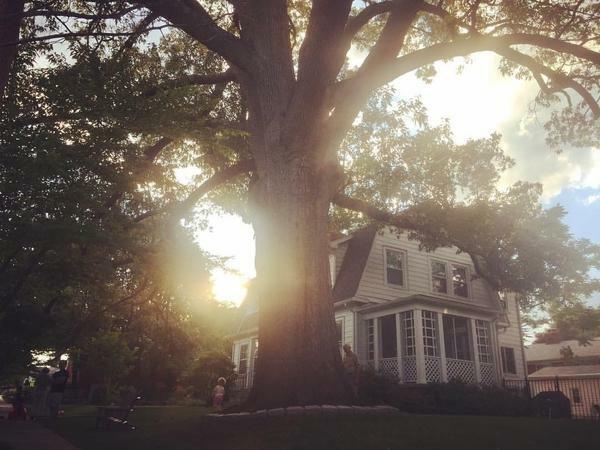 The tree was removed from its spot between two houses in northwest D.C. this week, as member station WAMU's Martin Austermuhle reports. "Removing the damaged tree took eight hours and a crew of half a dozen, and involved a crane removing two upper sections that combined weighed over 30,000 pounds," Austermuhle says. Arborist John Anna, president of Adirondack Tree Experts, tells WAMU, "This guy is an anomaly." In 1692 — 325 years ago — the Salem witch trials were resulting in executions. Spanish colonists were regaining control of Santa Fe after the Pueblo Revolt. Europe was at the height of the Nine Years' War, with Austria, the Holy Roman Empire and other nations fighting France. China's Kangxi Emperor issued an edict of toleration officially legalizing Christianity. Washington was still nearly 100 years away from becoming the nation's capital. For centuries, the tree withstood weather and man. As Austermuhle notes, the oak on Floral Street kept on growing, despite Britain's fiery attack on the White House in 1814 and the Confederate Army's attack on Fort Stevens, only a mile south, in 1864.